Compacted areas in lawns can be sporadic, affecting one a few areas, or it can be even over the entire lawn. Of the two possible types of aeration, Hollow tine aeration is the more effective treatment for severe compaction problems. This is different to solid tine aeration because it physically removes a ‘core’ of soil, allowing it to relax and breathe, creating tiny cracks in the ground below through which air, water and nutrients travel, helping to strengthen the grass root system. 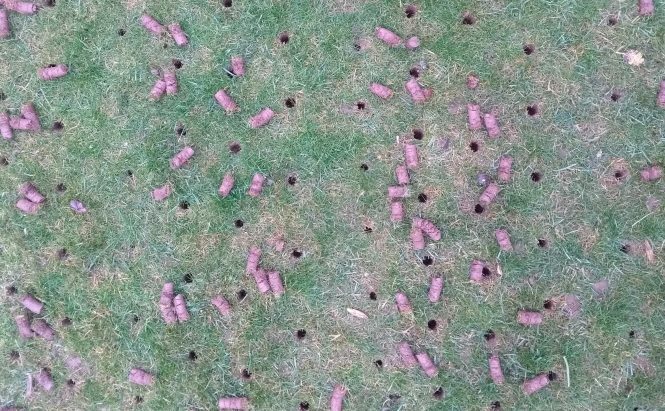 Aeration can be achieved using solid or hollow tines and I will be happy to advise you as to which option would be most suitable for your lawn. As hollow tine aeration removes a core of soil from your lawn, it is very important that these cores are removed, as, not only are they unsightly and cause a mess on your paths, but they also harbour weed seeds and moss spores, add to your thatch problem and when stepped on create little patties of soil which will be perfect seed beds for weeds. The Lawn Man always removes the soil cores left over from a hollow tine aeration treatment. They are certainly NOT a “top dressing”! It is one of the most beneficial treatments that can be done to your lawn. None, it is a recommended regular treatment for all lawns. A hollow-tine aeration treatment can be applied at any time of year if the conditions allow. It should be postponed if the soil is too hard from drought, too wet, or frozen. There is no preparation needed before a hollow-tine aeration treatment can be applied. It is appreciated if your lawn was cut in the week before the treatment. This enables the cores of soil to be more easily collected without damaging the grass leaves. This does depend on the size of your lawn, however it will usually be a few hours as all of the cores need to be collected and bagged. This treatment removes thousands of small cores of soil from the lawn. I will then collect up these cores and bag them up for disposal. These can then either put popped onto your compost bin (recommended if there are not too many), spread in a waste area of your garden (under conifers or hedges usually), put into your green bin for council collection, or I can take them to the local green waste disposal facility. Please be aware that these bags containing oil cores may be quite heavy, and if you feel this may be an issue, let me know and I will spread the load between more bags!